Globally, tobacco kills more than 15, 000 people every day, despite being the single most preventable cause of non-communicable diseases (1). By 2020, it is estimated that 1 in 10 deaths will occur as a result of tobacco (2), making tobacco a public health and developmental threat. Tobacco products (cigarettes, shisha and smokeless tobacco) have been reported to cause 16 different types of cancers, including lung and oral cancers, as well as chronic lung diseases; which increase the risk of death by 12 times. They have also been associated with increased risk of heart disease, stroke, diabetes and tuberculosis. Smoking among pregnant women increases the risk of miscarriage, preterm delivery, low birth weight and sudden infant syndrome (3, 4, 5, 6). 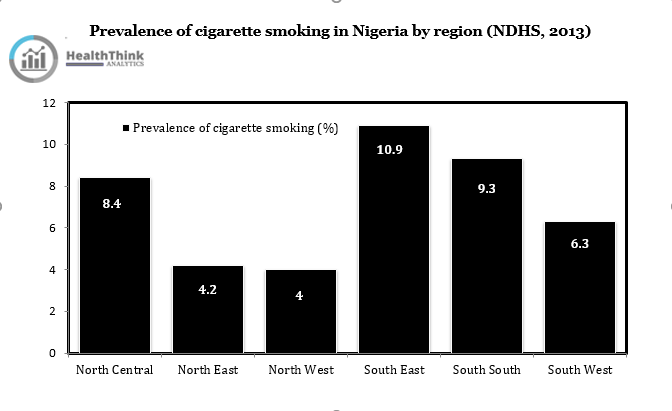 Despite these harmful and fatal effects, about 5 million Nigerians use tobacco yearly with the highest prevalence of smoking reported in South-East and South-South regions at 10.9% and 9.3% respectively, followed by the North-Central region at 8.4% (7). 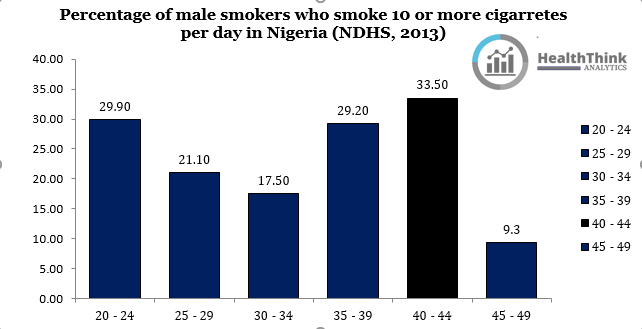 As a result, 310 Nigerian men and women are killed by tobacco every week (8). 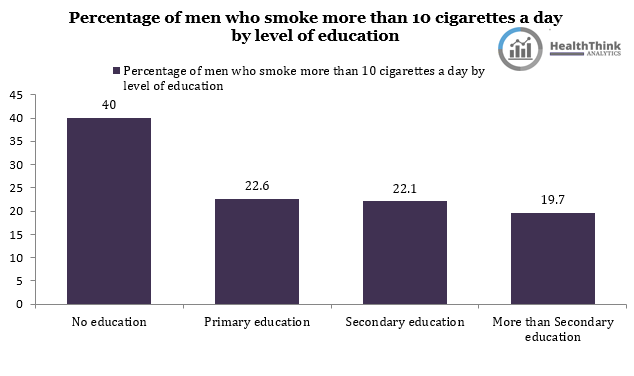 An even more troubling fact is that the highest percentage of men who smoke 10 or more cigarettes in a day is among men aged between 40 to 45 years. This age group is already particularly susceptible to cardiovascular diseases and cancers, and the addition of cigarette smoking increases this risk (7). 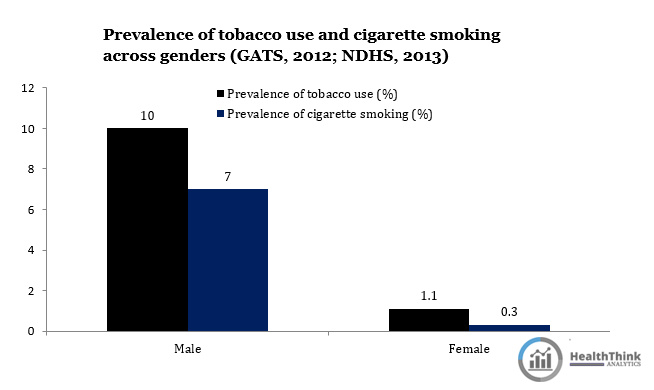 In Nigeria, tobacco smoking is more common among men than women, with a much higher prevalence of smoking reported among males at 7% than females at 0.3% (7, 9). However, 300, 000 female non-smokers are killed yearly by tobacco, due to exposure to second hand smoke. Pregnant women exposed to second hand smoke are at a higher risk of preterm delivery and other poor maternal outcomes (10). Children are not left out of this menace, as 150, 000 children under five years old are killed by second hand smoke yearly (11). 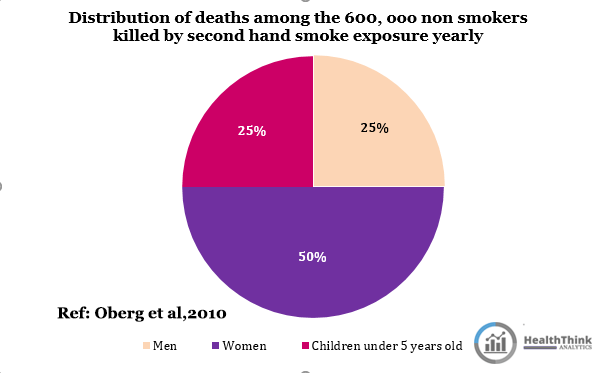 Second hand smoke exposure among children has also been associated with decreased lung function, increased risk of lung infection and asthma (10). Non-smokers are commonly exposed to second hand smoke at work, restaurants and bars, as well as in their homes. 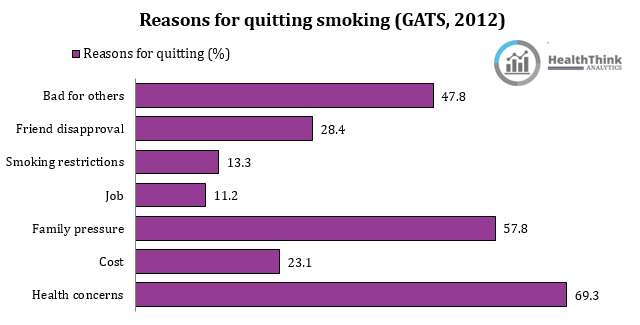 What’s even more troubling is that about 2% of non-smokers are exposed to second hand smoke in health facilities (9); a place that is meant to heal, and not kill. 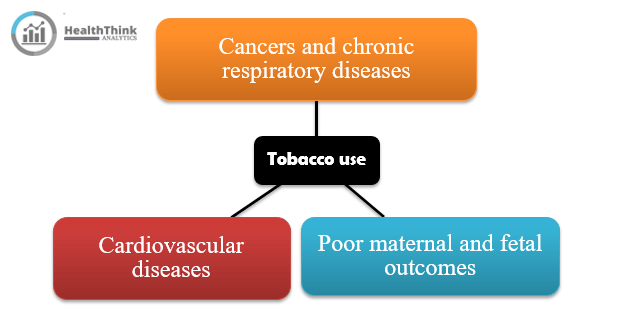 Tobacco consumption also affects socioeconomic status of Nigerians, and consequently the economy of the country. The high mortality and morbidity rates resulting from tobacco consumption leads to the premature loss of productive lives of men, women and children, which is important for the growth of any nation’s economy. 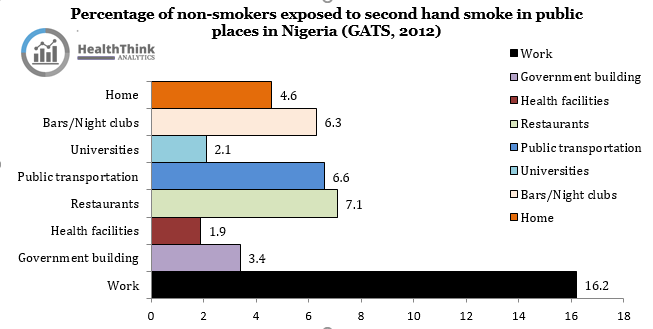 A whopping 7.45 billion naira is spent by Nigerians to buy cigarettes each year (12). A smoker spends 1.8% of the national average income to buy 10 of the cheapest cigarettes every day (8). What’s worse? Those who have no form of education (an indicator of poor socioeconomic status) are more likely to smoke 10 or more cigarettes in a day, compared to those with higher educational levels (7). Hence, they spend scarce financial resources on cigarettes; resources that could have been spent on necessities like food and healthcare. 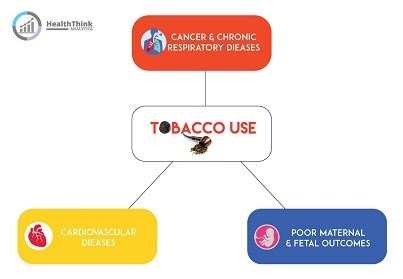 Furthermore, diseases caused by tobacco consumption are almost always chronic diseases which are expensive to treat (if treatable) and even more expensive to manage, resulting in families driven into poverty by tobacco. Our environment also suffers from tobacco consumption. It has been reported that the air pollution caused by tobacco smoke alone is ten times more than that of a diesel car exhaust. Also, the cigarette butts disposed carelessly in the environment ends up as toxic waste because they contain chemicals, pesticides and nicotine (8). These health, economic and environmental effects emphasize the need for a more effective enforcement of the recently passed tobacco control bill, which prohibits the display of smoking in media, advertisement of cigarette products, the sale of tobacco products to children. It also prohibits smoking in public places, in order to prevent non-smokers from having to face the dangerous effects of tobacco. According to the GATS report, more than half of smokers aged 20 to 34 years started smoking while they were still adolescents (9). As, adolescence is the phase where lifelong habits, and risky behaviors are developed, this calls for the need to carry out smoking prevention interventions among adolescents in school and out of school. In addition, it is also reported that smokers who quit or intend to quit majorly do so for health reasons. Hence, emphasis can be placed on health effects of smoking in health promotion messages. Proper smoking cessation clinics should be set up to support quitters, and to provide the necessary support to smokers who intend to quit. More research on the economic costs of smoking and other forms of tobacco use (shisha or water pipe smoking) need to be conducted. Although, Nigeria records a low prevalence of tobacco use when compared to other countries, its use is rising, especially with the visible increase in the uptake of shisha smoking. We must therefore act now to prevent what is creepily crippling our already fragile state of development. World Health Organization (2011). Global status report on non-communicable diseases 2010. Geneva: World Health Organization. Beaglehole r, Bonita r, Horton r et al. (2011). Priority actions for the non-communicable disease crisis. The Lancet, Early Online Publication, 6 April 2011doi:10.1016/s0140-6736(11)60393-0.
International Agency for research on cancer (2007) Smokeless tobacco and some tobacco specific N-Nitrosamines. Lyon, France. World Health Organization International Agency of research on cancer. IArc monographs on the evaluation of carcinogenic risks to humans Volume 89. Us Department of Health and Human services (2004). British Medical Association (2007). Breaking the cycle of children’s exposure to cigarette smoke. London: British Medical Association.